In 1921 E.W. “Billy” Ingram and Walter Anderson opened America’s first burger joint, a tiny white cement-block building with five counter stools in Wichita, Kansas. It was a bold move at the time. Food prepared outside the home—particularly “fair food” like the hamburger, a meatball Walt had flattened into a bed of onions and put on a small bun instead of bread—was viewed with suspicion regarding its safety. 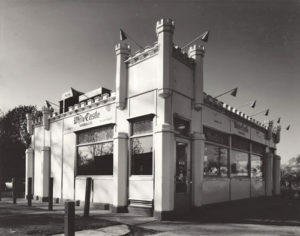 White Castle became known for its restaurants’ distinctive white turrets. But Billy was a born marketer and a stickler for quality. He christened the business White Castle—“white” implying cleanliness and purity and “castle” denoting stability. Employees ground high-grade cuts of beef in plain view of customers. In 1933 he bought out Walt and the next year moved the fledgling chain’s offices to Columbus, a central seat of power for a realm with 16 stores from Kansas to New York. The restaurants with white turrets became landmarks. The burger, dubbed a slider, was distinctive: a square 2-by-2-inch patty with five holes. That form eliminated the need for flipping and promoted steaming of the same-sized bun placed on top during grilling, according to Vice President of Manufacturing Dave Rife. “[Our buns] are designed to capture that steam-grilled freshness and flavor and hold it,” he says. Today White Castle, still family owned, employs more than 10,000 people. Most of the 382 restaurants in 13 states and two countries are open 24 hours a day. “It’s a hallmark of White Castle that the Castle never closes,” declares Jamie Richardson, vice president of communications and corporate relations. 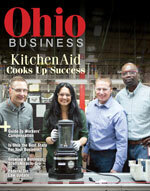 Two bakeries and three meat plants produce patties and buns for the restaurants as well as a frozen-food division. Three facilities turn out heat-and-eat sliders, along with a selection of other menu items, for sale in supermarkets, club and convenience stores, and even vending machines. 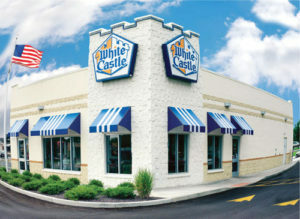 White Castle doesn’t dominate its industry in terms of restaurant locations. McDonald’s, for example, has over 36,000. But those retail sales, which accounted for nearly 25 percent of approximately $711 million in gross sales for 2017, give the company an edge. “[We] have a presence in practically every neighborhood around the country in the freezer aisle,” Richardson says. That presence began expanding to Canada in 2017. According to Richardson, it was White Castle customers who inspired the creation of a frozen food division. 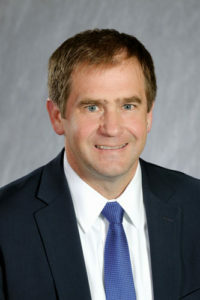 In the 1980s third-generation President and Chief Executive Officer E.W. “Bill” Ingram noticed during his annual restaurant visits that they were taking home large orders to freeze and microwave. Those legions of loyal Cravers (a name resulting from a 1990s “What You Crave” ad campaign) include actor George Clooney and rocker Alice Cooper. Customers even develop recipes featuring sliders as the key ingredient for company-sponsored contests. The very first winner, in the early 1990s, was a young woman who came up with a broccoli cheese casserole. The best recipes end up in cookbooks. Those hamburger fans have reunions at restaurants and completely book restaurant tables on Valentine’s Day evening. Richardson says an average seven to 10 of the most passionate Cravers (identified by the lengths they go to satisfy a yen for or exhibit devotion to White Castle) have been inducted into the Cravers Hall of Fame each year since it was established in 2001. 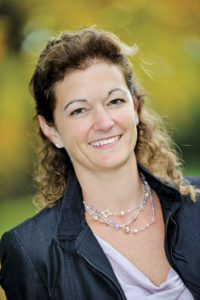 Those customer pleas for local restaurants, along with retail sales and lines at White Castle food-truck stops, help determine where new Castles are built, according to fourth-generation President and CEO Lisa Ingram. In 2015 the first of three Las Vegas-area Castles—the first outposts west of the Mississippi—opened in The Best Western Plus Casino Royale on the Strip. The action was the result of a licensing agreement with a group of family-owned convenience stores. (At press time another is scheduled to open in Scottsdale, Arizona, in 2019.) And in 2017 the company entered into a joint venture with a management company to open two locations in Shanghai, the first outside the United States since an unsuccessful international foray during the 1980s. Cravers have seen changes in their Castles over the years. New and rehabbed blue, orange and white interiors boast features such as an open kitchen, free Wi-Fi and Coca-Cola Freestyle stations, where Bartley says customers combine Coke products to create over 140 different flavors. Similarly, the menu reflects trends in consumer tastes. Ingram notes two additions: the Sriracha sauce-infused chicken breast slider, a limited-time item that appealed to a desire for bolder flavors, and the Impossible Slider, a 2018 addition featuring a plant-based protein patty produced by Silicon Valley-based Impossible Foods that Bartley and Rife say tastes like a real hamburger. White Castle has 382 restaurants in 13 states and two countries. But White Castle isn’t looking to rule the burger world. Ingram points out that remaining a family-owned company (nine fourth-generation members, including Richardson and Rife, and one fifth-generation descendant are actively employed in the business) allows White Castle to pursue its goals of consistently providing a quality product and good working environment without worrying about short-term numbers. Ingram points out that some workers have been with White Castle for up to 40 years. Of the top 450 restaurant-operation leadership positions, 442 are held by employees who started behind a counter at an hourly rate.